I wanted simple, easy decor for the dining room table this year for Thanksgiving. Not because I’ve added complicated decor in the past but because I tend not to do anything. My biggest accomplishment on Thanksgiving is getting the food ready. And when we all sit down to eat, we have to move the decorations out of the way so we can get to the main event…the food! But this year I wanted it to look pretty for before and after the feasting. I started with a grapevine wreath from Trader Joe’s and added a few white candles and a variety empty jars in the middle. Then my mother in law and daughter bought some pretty flowers at the grocery store and divided them up amongst the jars. 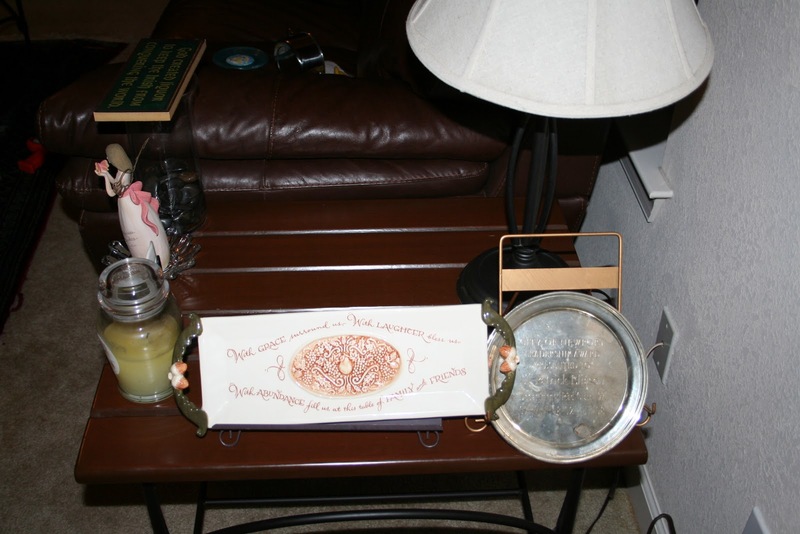 I have a few fall themed serving dishes I’ve collected over the years to place on each side. I made the placemats, originally intending to sell them in my Etsy shop, but after I washed them I realized that they had some construction problems so they became mine. And I’m kind of glad about that! (They work perfectly well but when I wash them I have to unbunch the batting I used inside since I failed to catch it with my topstitching. Lesson learned for future placemats!) But the placemats add a little bit of relaxed beach style to our Thanksgiving scene. We had a wonderful Thanksgiving dinner around this table and I’m glad it was pretty too! Using some items I had on hand and an inexpensive bunch of flowers helped make our day even more special! Last week I got to spend A LOT of quality time with Casey while Jack was at school. Even though we went out to a store every day, we still spent a lot of time at home. 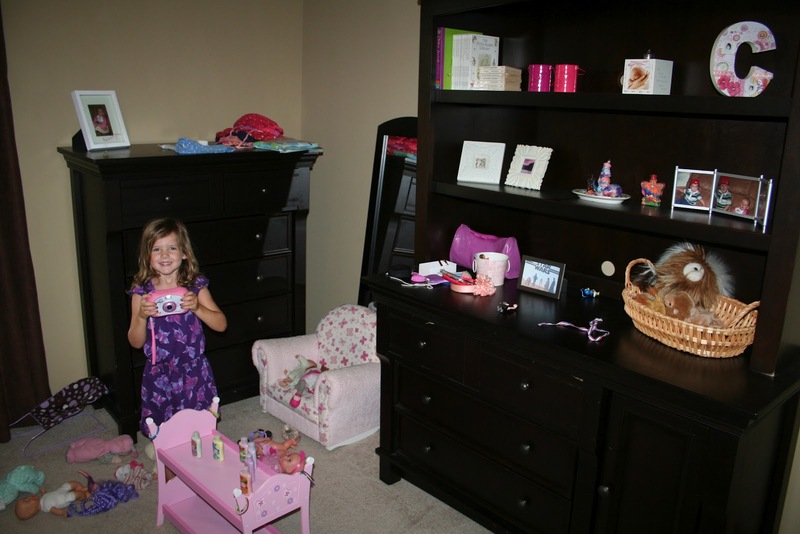 The Barbie/Princess family also had a very busy week. They celebrated birthdays, went to the pool, went to the beach, went to the hairdresser, changed outfits a lot, and witnessed some amazing high diving by Cinderella. In between Barbie adventures, I tried to do some little projects around the house that I thought Casey would be interested in. If I wanted to sew, I sewed something for her. One dress turned out to be a big failure and the other still needs just a little finishing. 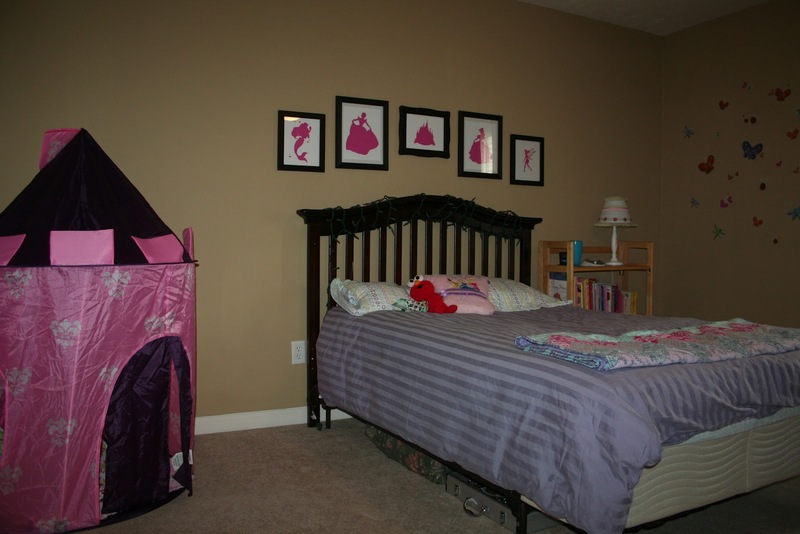 I also decided it was time to get the big bare wall behind her bed decorated. 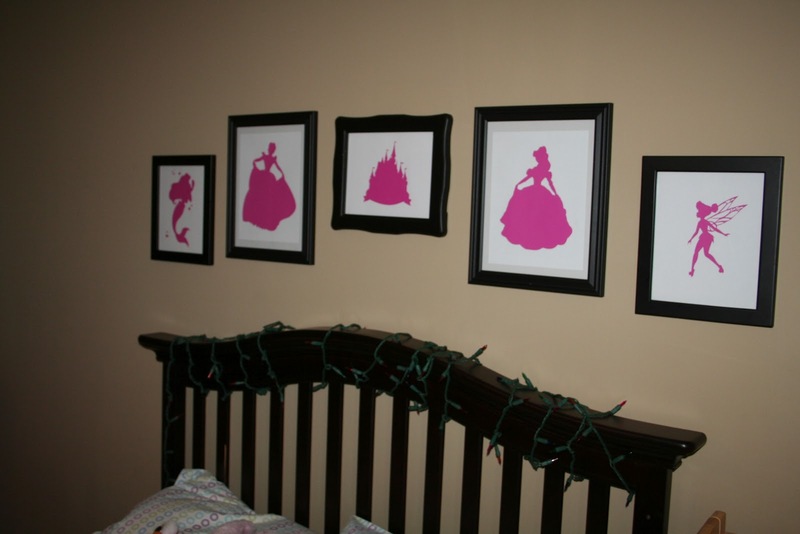 A few months ago I found a great idea on Pinterest to make silhouettes of the princesses and use them as art. 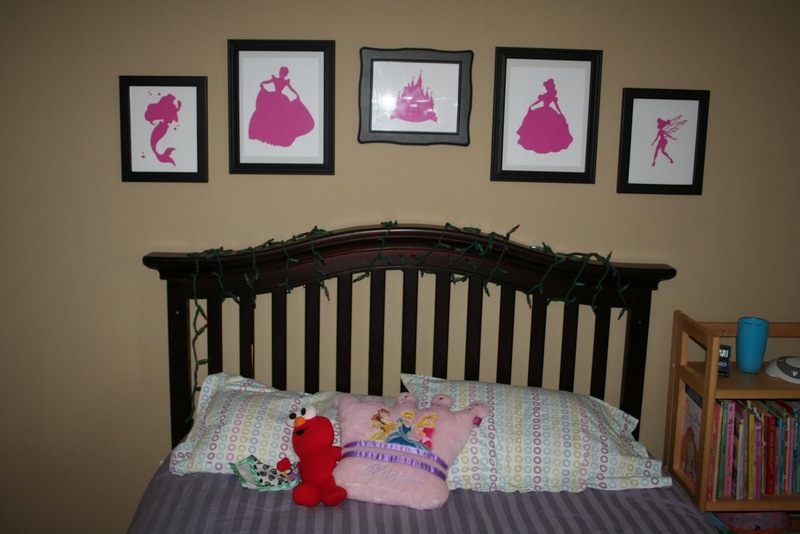 I thought this was a much more subtle princess decorating idea versus some big poster of the princesses. Basically I didn’t want anything too cartoon-y. I also have a Silhouette cutting machine that has been sitting idle for some time and now I have a big space near the computer for it. 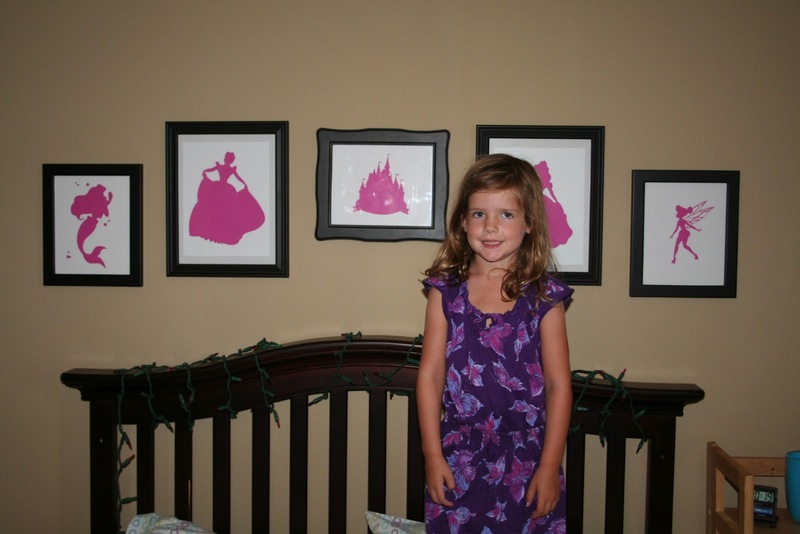 After a little search online I found the Crafty Mama blog where she had already created templates to use with the Silhouette. On Friday, I put the frames on the wall and got ready to take some pictures. 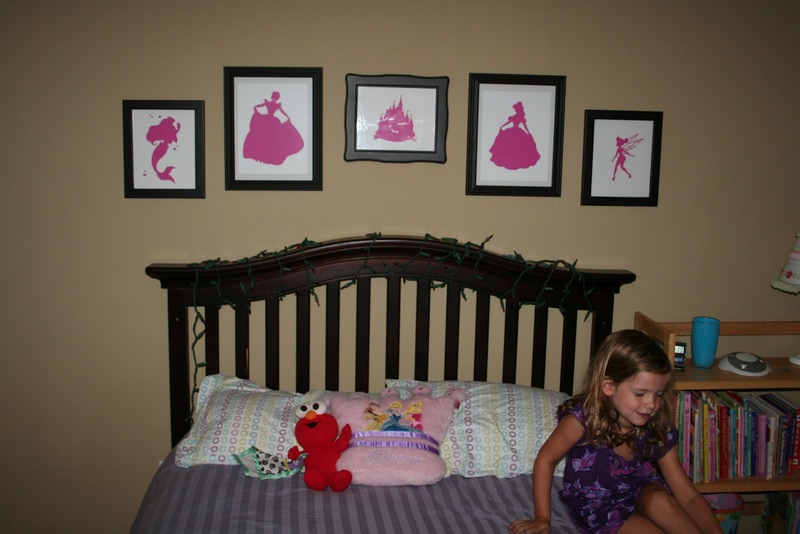 I probably spent more time cleaning her room than hanging pictures. Casey was too busy with her babies to help. Casey managed to be in almost every picture. She also wanted to take some pictures with my camera but they didn’t make the cut for this post. I finally convinced her to go get her own camera. Then she was even more in my way as she tried to get all her pictures. She has Christmas lights wrapped around her bed and sleeps with them on every night. After Christmas was over, she didn’t want to take them off. We’re now on our third strand. It makes for a nice little night light for her. Her bed still needs a new bedskirt. 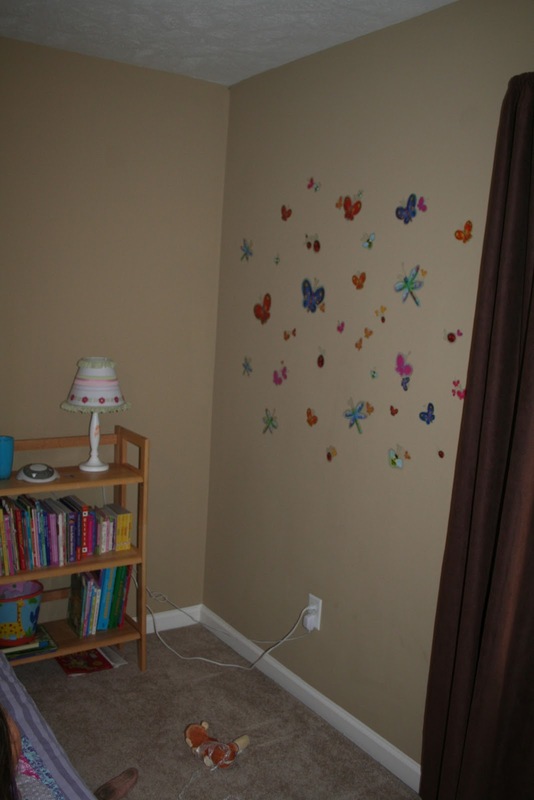 This is Casey’s wall of butterflies and dragonflies. We found some vinyl Star Wars stickers for Jack soon after we moved here and I guided Casey towards these butterflies. 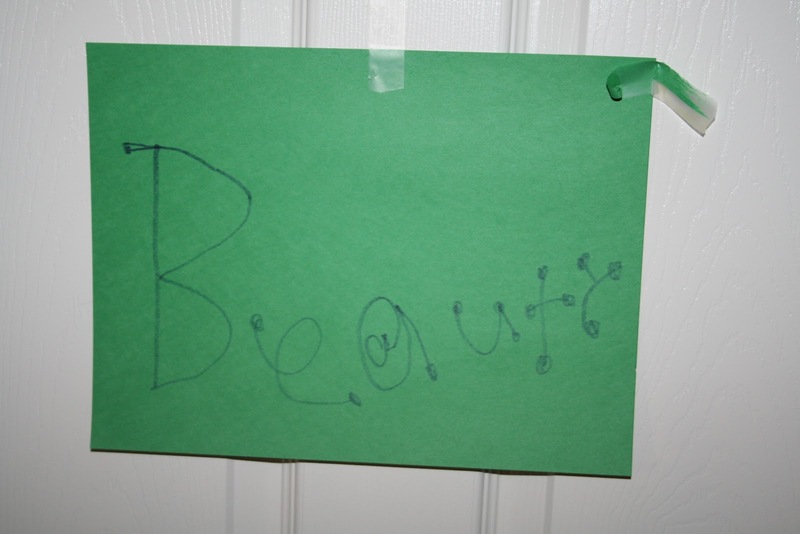 It was one of the first things we put up in each of their rooms. Here are the signs for Casey’s room. It’s been used as a storefront lately, which was why I had to do a lot of cleaning. Casey was selling lotions in there and then it turned into quite an operation one night as they were both making jewelry and selling it. Casey made the small yellow sign which has her name on it. Jack made the larger green and yellow signs. 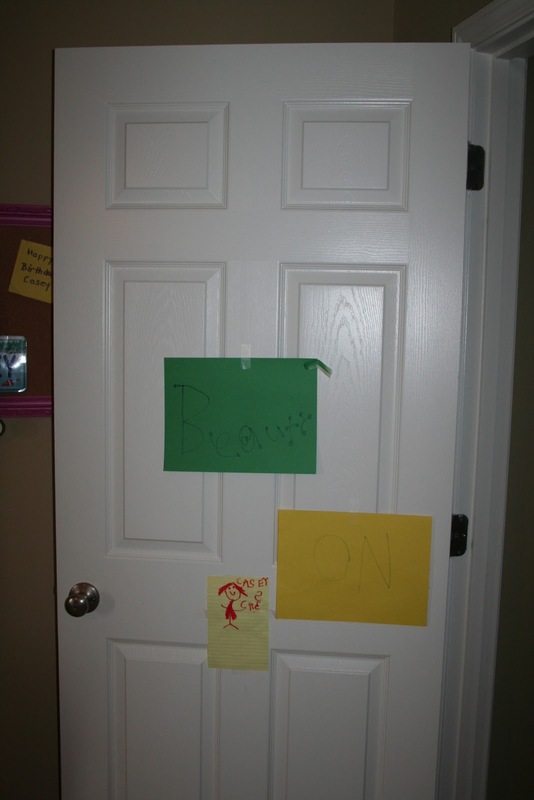 The green one says “Beauty” and he made it fancy (like Grammie did when she was babysitting in April) and the yellow one says “On.” Jack decided that he would rather have No and Yes signs instead of Open and Closed but then No turned into On. This is the wall opposite the bed. It’s not quite as neat…once again Casey was busy with her babies and the lotion store (which she has staged on her empty doll bunk beds). And her top drawer is broken from the move or else I would fill it with all the junk beautiful hair bands/elastics/bows/etc. sitting on top of her dresser. And so, Casey’s room is the first room I’ve gotten to in showing off our new house. Casey and I have another long week together so maybe we can get to some more projects. Pat asked me today when I was going to finish hanging pictures in the rest of the house. Sometimes I just can’t decide what I’m going to do and I do nothing! We’ll fix some of that next week. 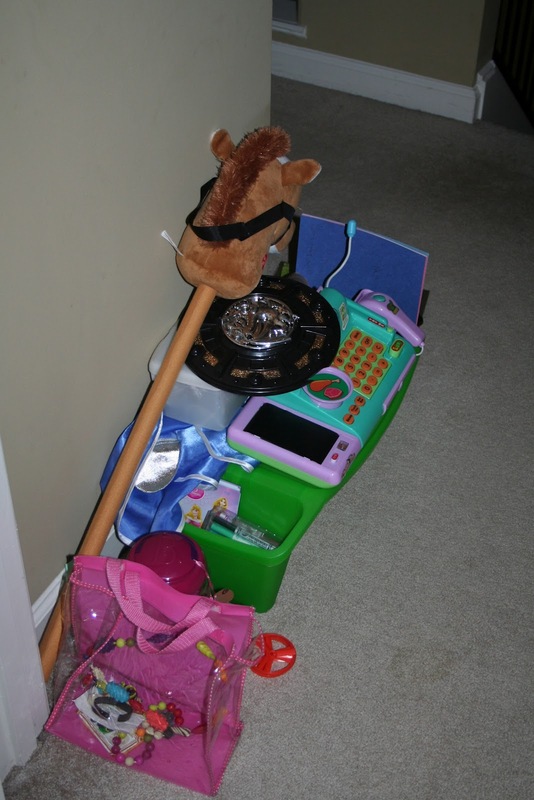 After the dump truck of toys stopped by over Christmas, Pat and I were throwing around the idea of turning our front room into more of an official playroom. There have always been toys in it but it’s not exclusively for toys. After deciding that I didn’t want to do that, I couldn’t sleep last night and kept rearranging furniture in my head. I’m trying not to be afraid of changing things and moving furniture because all I have to do is move it back if I don’t like it. It’s funny that I shouldn’t naturally think that considering the number of times I moved my furniture in my bedroom growing up. Anyway, by the time I went to sleep last night I had come up with some good furniture arrangements and thought I might just go for it. This morning I didn’t really think about playrooms all that much given that we actually had to get up, get dressed and leave the house today to get Jack to school. I think I could have used another week of vacation. The kids weren’t even getting on my nerves yet. Sometimes a big infusion of toys is all they need to get along a little better. While Casey was napping this afternoon, I was trying to get some things done on the computer, like reading other blogs and looking at great projects other people have done and thinking, ‘I should do that someday.’ I paid some bills too. Jack decided that it would be a great time to bring a Lego creation over to disassemble, placing the pieces strategically around the mouse. And that was my inspiration to do a little reorganizing. I ran upstairs and dug our 2nd coffee table out of the upstairs toy closet and brought it downstairs. Before I go any further, there are no pictures of this process yet because it’s still a bit of a disaster. It had to get worse before it could get better and it’s just now making the turn. Pat has asked me twice already if I plan to keep a 6 foot tall bookcase in the middle of the living room. I brought the coffee table downstairs and moved Jack’s pile of Legos to the table. He went and got himself a Buzz Lightyear chair and happily sat creating a new airplane for his aircraft carrier. 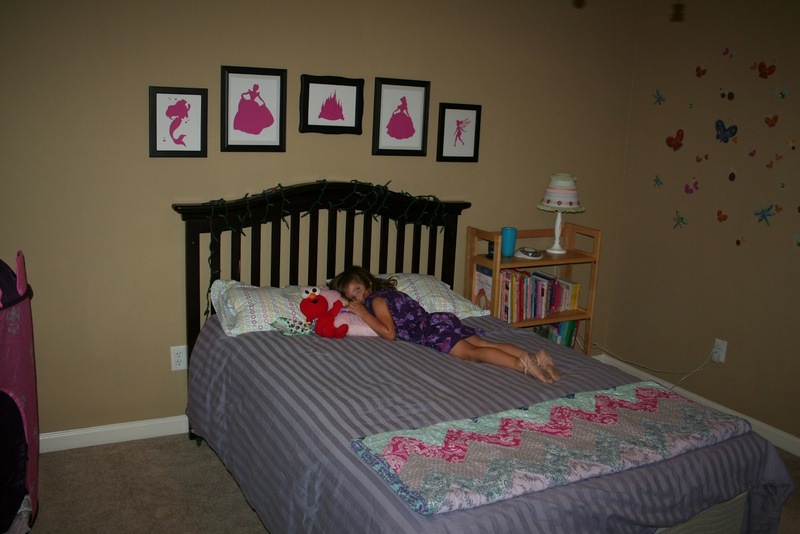 I was able to get back to blogland without a pile of Legos and child under my elbow. I wondered why I hadn’t thought to bring the table down months ago. When Jack was a baby we baby-proofed this table and stuck the spongy rubber stuff around the sides so he wouldn’t bump his head on the sharp edges. We’re a little past the baby proofing stage around here now but I decided that rubber stuff is staying on. It’s primary purpose now is to keep Legos and puzzle pieces on the table. Brilliant. From the coffee table to moving a 6 foot bookshelf to moving a bunch of toys around, the room is now more of a playroom but I didn’t move any major furniture beside that bookshelf. (And a small kitchen.) In the midst of this Jack thought he would help me. He just started pulling things out of cupboards and shelves and saying, “I’ll put this here and this here and this here. See how I’m fixing it Mommy?” When I took some old frames and knick knacks out of a cupboard he asked where they were going. I was planning to put them back in a different cupboard but I asked him where he thought they should go. And boy, did he have some opinions. More like steadfast confidence in his decorating ability. He knew exactly where things needed to go and how to do it. I’ve already signed him up for the next season of Design Star on HGTV. 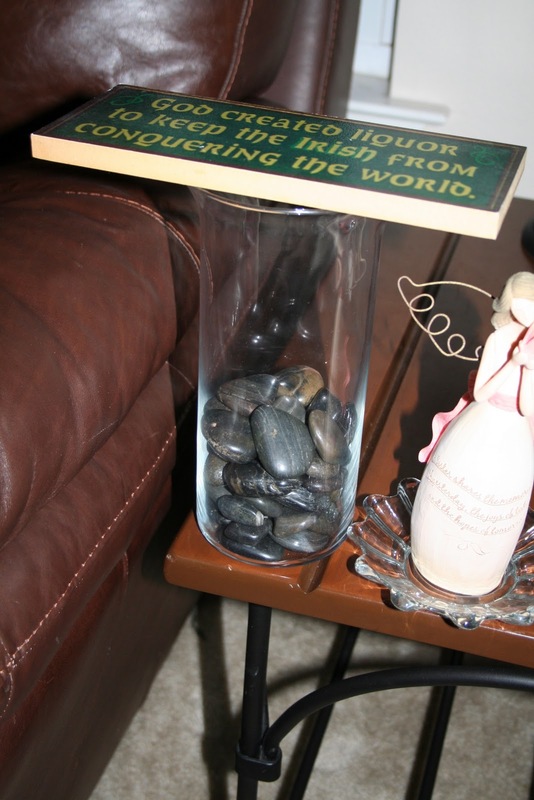 “Mommy, what rocks do you want to put in this jar?” he asked as he pulled out a bag of rocks and a clear vase. It was obvious that he didn’t even need me to answer that because rocks were already going into the jar. 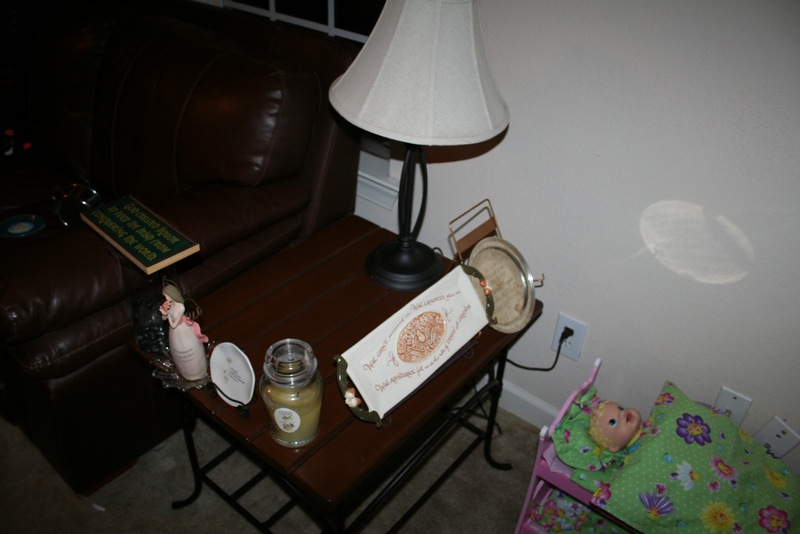 He was very serious about his tasking and his end table was decorated in no time. I’m afraid to move things now.